Worst Scifi Movies? Reviews and Opinions. Being an avid Scifi movie fan, I have been let down often by the hype and trailers for many films that promise much but deliver little in the genre. When I feel like this, I tend to trawl Amazon and Rotten Tomato reviews to see what other people think – sometimes I am wrong, while other times I find plenty of support for my views. Below I have taken a stab at some that I feel may have failed to either deliver the full hype, or just missed the mark completely. Michael Bay’s first Transformers movie was a pleasant surprise to most fans of the 1980s toy and cartoon franchise. Featuring plenty of action and a reasonable story line (for a Michael Bay action movie anyway), the first Transformers live action movie had heart and maintained some semblance of continuity with the canon and mythology established by the 1980s version. With Transformers: Revenge of the Fallen, Bay threw everything that was good about the first movie out the window and amplified everything that was bad. The plot or lack of one was the main problem with the movie. Rather than focusing on story, Bay made fast paced action scenes that were hard to follow the meat of his movie, resulting in nearly 3 hours of hard to follow fights that got downright boring after a while. Not only this, but Bay committed the ultimate sin in relegating Decepticon leader, Megatron into a servant of one of Bay’s newly created Transformers(see Shannons Comments below)… The film has a 4 and 1/2 star review on Amazon but I dont think it deserves it. Ask any Star Trek fan what their least favorite movie of the set is and 9 out of 10 will give Star Trek V that dubious distinction. What makes Star Trek V so bad? Where do you begin? With Spock’s “long lost brother?” Or perhaps Kirk, Spock, and Dr. McCoy sitting around El Capitan in Yosemite Park, roasting marshmallows and singing “Row Row Row Your Boat.” No. Any discussion about Star Trek V has to begin with Kirk meeting God; except that he didn’t actually meet God. It was really just an alien pretending to be God so that he could carjack the Enterprise to escape his prison. Any further discussion of how bad Star Trek V is becomes a moot point after that. But it is actually because of all of STAR TREK V’s flaws that I have longed for this DVD above all the rest of Paramount’s line of Special Collector’s Edition Star Trek DVDs. I’m eagerly awaiting learning all about the film’s troubled production and Paramount’s butchering of the budget. It may help to improve my (as well as countless others’) opinion on the film. The biggest dissapointment here is the script, no real plot and flat, one dimensional characters … The social commentary, so important to the original, is almost completely lacking here. Early on in the story there are some token nods to racism and human vs animal rights but then the writers never develop them. … The characters, especially the human ones, are hardly worth caring about. The full review is worth reading.. The biggest problem with most prequels is that the audience knows how things turn out in the end. The Phantom Menace is no different, but commits the ultimate sin in tarnishing the legacy of the first movie. Between the wooden acting from Natalie Portman and Jake Lloyd and the aliens with horribly offensive accents, the Phantom Menace fails to live up to expectations. Granted, the expectations were impossible to meet, but everyone expected a better effort from George Lucas. One of the biggest gripes that fans have about The Phantom Menace is Lucas’ insistence of including ridiculous characters in his movies like Jar-Jar Binks. Return of the Jedi’s much maligned Ewoks seem completely acceptable after Jar-jar Binks appears on the screen. Irritating beyond belief and serving no purpose other than “comic” relief, Binks set the tone for the rest of the movie that seemed to be set on destroying the childhood of every kid that grew up with Star Wars. On the other hand Jar Jar was a hit with the kids. To be honest this is just a mind numbing action film. NO ONE on rotten tomatoes seemed to want to review by the looks of it. And I completely disagree with everyone on Amazon that has given it a favourable review. A complete and utter piece of tosh. Let us, gentle reader, ignore this films failure as a sci-fi / religious movie and let us celebrate its triumph as the greatest comedy of all time. Only people who enjoyed this film were probably Scientologists. Cant be bothered to write anything else about it – see this persons big list of plot holes. First of all, I am a huge fan of anything sci-fi. That said, chances are that if you liked “Serenity” and “Firefly”, and if you could imagine those movies/shows with a lot more humor and camp, then “Lost in Space” is the movie for you. I had never seen the TV Series as I wasn’t born then, but the film is a delightful confection, one that you will surprisingly keep remembering days after you’ve seen it. 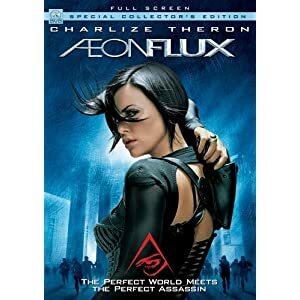 I loved the Aeon Flux Animated Series. The movie, not so much. to be honest it had the makings of a great movie, but somehow I feel that the story line was diluted – I cant put my finger on it, but something somewhere ruined the film for me. Saying that, it isnt a total waste of time and worth at least one view, and I think many agree to the fact. No, the problem lies in the missing minutes of film (anywhere from 15 to 70) that were allegedly cut by the producers to fit the movie into an hour and a half, leaving the director to disown “Babylon A.D.” The cuts aren’t readily apparent until near the end of the ninety minutes, when the characters enter America. Then it’s obvious that there are vast gaps in continuity, making for a shortened and confusing ending. At least, the editing is the kindest explanation I can come up with. I’m not a Transformers fan, so I could be wrong about that. Also, apparently a lot of what was cut from Babylon AD involved the refugee culture. Apparently the original had a lot more world-building in that regard. Previous post: Dear Twitter – Get your Back to the Future Facts Right!